The work of Eric Uhlfelder is driven by two major concerns: the beauty of urban form and the remembrance of things past. Venice in color looks at the city in a strikingly different manner. The walls of Venice are one of the city's most indigenous and anachronistic features. By focusing upon them close up, the surfaces of barns, railroad cars, building fenestrations, and interiors read as modern abstract art. (please see "Abstract Venice"
Over the past 30 years, Eric has also photographed New York, London, Prague, Milan, Rome, Frankfurt, Salzburg, and Dachau. Shooting in black-and-white and color, his portfolio also includes landscapes of the Dordogne, Normandy, Switzerland, the Veneto, eastern Long Island, and Maine. 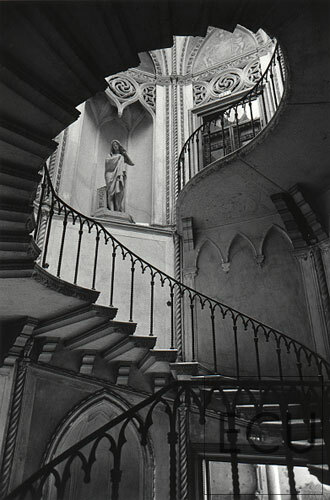 Commenting on Uhlfelder's black-and white work on Venice, the Italian designer Massimo Vignelli wrote: "For someone like me who spent years in Venice, the sites in Eric's book are familiar, but his photographs transform them into new unpredictable images, beautifully composed and bathed in a magical stillness." Paul Goldberger, the Pulitzer Prize winning architectural critic of The New Yorker, described "Eric's Paris . . . as rendered fresh and new . . . full of energy . . . exhilarating, yet intimate, powerful, yet delicate, and ever so slightly mysterious." Uhlfelder's exhibitions have included one-man shows at the national headquarters at the American Institute of Architects in Washington, the Casa Italiana Zerilli-Marimo and the Maison Française in New York, the French Library in Boston, and La Rotonde en Montparnasse in Paris. His work has been regularly exhibited at RVS Fine Art in Southampton, New York, and in Venice at Mozart Art Studio and Venice Design. His work has been published by Editions Flammarion, Rizzoli International, The New York Times, Architecture d'Aujourd'hui, Architectural Record, Metropolis, World Architecture, Italian Life, Avenue, and Editions Hazan. And his images have been acquired by various institutions, including the Musée Carnavalet in Paris, Bibliothéque Historique de la Ville de Paris, Galeries Lafayette, Saks Fifth Avenue, Bloomingdales, ITT Sheraton, and Proctor & Gamble.